Although it officially has the the rather ignominious name of PN G75.5+1.7, the Soap Bubble Nebula is nonetheless a beautiful example of a planetary nebula. These type of nebulae are formed when stars are in their later stages. During the red giant phase of a star's life, the strong stellar winds will blow off shells of gas. Ultraviolet radiation from the star's core heats up these shells and ionizes the gases, primarily Oxygen. We see this superheated shell as the planetary nebula. In the case of the Soap Bubble Nebula, this shell forms a nearly perfect sphere. 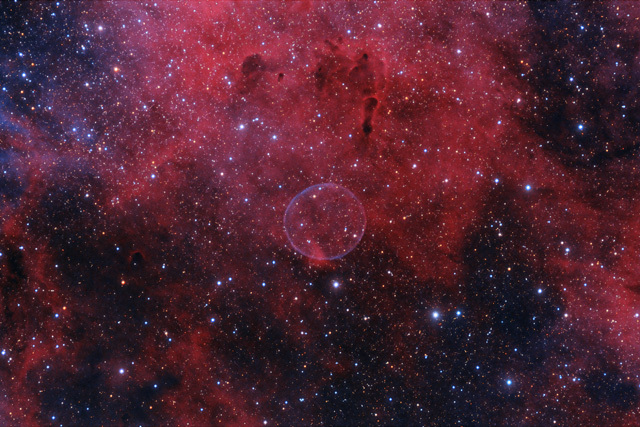 The Soap Bubble Nebula is extremely faint, which explains why it wasn't discovered until recently. The nebula is located in a very commonly photographed portion of Cygnus, just 2/3 of a degree from the very popular target, the Crescent Nebula. Nevertheless, the Soap Bubble Nebula wasn't discovered by amateur astrophotographers Dave Jurasevich, Mel Helm, and Keith Quattrocchi until 2008. The Soap Bubble Nebula is believed to be located about 4,000 light years away from us. It's angular size of only 4 arcminutes translates to a diameter of about 5 light years. In this image, North is to the Right. This image is cropped to 93% of the original full frame. SQM Reading Bortle 4 on all 6 nights, typically 21.35 to 21.55. Some narrowband data captured with Moon up. Software Used Sequence Generator Pro for image capture, Astro Pixel Processor for calibration, pedestal addition, normalization, integration, and initial DDP stretching. Images Plus for star size reduction, edge masking, feature mask, and noise reduction. Photoshop CS5 used for levels and curves, dust and scratches filter, star removal, saturation adjustments, selective color, match color, high pass filter, narrowband colorizing and stack blending. Gradient Xterminator for gradient removal. Carboni Tools for additional noise reduction and smoothing. Registar 64 for stack alignment. Focus Magic for focus restoration. PlateSolve 2 for plate solving. Notes This target can be very elusive, so I'm really pleased with having been able to capture it. I like the way my color combination worked, particularly the colors in the stars. I had tried some new techniques when processing my last image (NGC 6820) and had to fight some battles with it. Eventually, I was able to pull out a decent image, and I learned enough to apply those techniques better with this image. So, I'm glad I fought those early battles.